This charming fine art Hand Painted Limited Edition Cel captures a classic moment from Disney’s 1941 feature film “Dumbo”. Recreating Sequence 6, Scene 4, Dumbo finds warmth and solace in a cozy bath drawn by his loving mother after he has had a trying day. 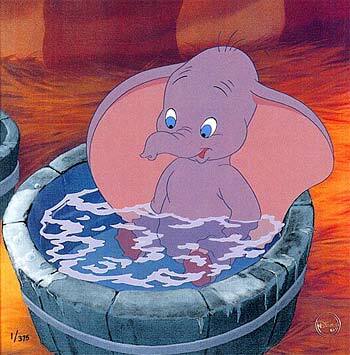 Legendary Disney animator Vladimir ‘Bill’ Tytla, who said at the time, “I don’t know a thing about elephants”, animated the sequence depicted in Bathtime. The original animation drawings were transferred to acetate using a special six-step process, then enhanced with two hand-inked colors to insure the faithful recreation of the characters.